Excellence in coaching will be the focus for Central Cross Country Skiing's (CXC) seventh annual Wayne Fish Coaches Conference & Certification workshop presented by Podiumwear Oct. 19-21 in Cable, Wis. The conference includes a star-studded lineup of presenters. Russian born and Canadian citizen, Ivan Babikov has extensive international experience. He participated in two Olympics, the 2006 and 2010 games and raced on the World Cup circuit from 2002 until 2016. Babikov has 33 individual career victories and several high profile career bests. In January 2009 he finished first in the final stage of the Tour de Ski, becoming just the second Canadian man to win a World Cup race. During the 2010 Vancouver Olympics, Babikov raced the 30km skiathlon and placed a Canadian best ever fifth in a race in which three Canadians were in the top-10. His impressive World Cup results include; a 4th place finish in the 15km 2013 World Championship, a 7th Place Tour de Ski overall finish in 2013, he finished in 2nd Place during the 9km Hill Climb at the 2013 Tour de Ski and 7th in the 15km skate race during the Tour de Ski in Val di Fiemme. More recently Ivan had been coaching the Canadian National Team. This is a unique opportunity to ask questions and learn different coaching principles from top national team coaches. Bryan Fish who is the development coach for the US Ski Team will also be joining Ivan Babikov as they discuss various topics including; the Canadian training model and philosophy, coaching principles, technique and strength training, and classic and skate technique presentations. Steve Myrland is currently the Wellness Director and District Performance Coach for Athletics at Middleton School District in Wisconsin. As a strength and conditioning coach at the University of Wisconsin (1988-2000), Myrland was part of Big Ten and national championship in hockey, soccer, cross country, tennis and rowing. In 1993-94, he worked with the San Jose Sharks where the Sharks set an NHL team record for single-season improvement. Steve is also a faculty member of the GAIN Network, which provides a global platform for education, innovation and motivation in athletic development. Youth programs are the core of the future. CXC's Youth Coordinator Amy Cichanowski is a veteran athlete who has become noted for the passion she brings for youth. A native of Winona, Minn. who now lives in Minneapolis, Amy has an extensive background in cross country skiing as a competitor, coach, mentor and serving as executive director of the Minnesota Youth Ski League (MYSL) - now the largest youth ski organization in the country with over 2,000 members. She has been instrumental in the success of the CXC Youth Cup series. As an athlete, Amy was a Minnesota state high school champion, competed in three Olympic Trials and won three Kortelopets plus a half-dozen top-10 Worldloppet finishes. Amy is a U.S. Ski & Snowboard level 200 certified coach and a Professional Ski Instructors of America level 2. She brings with her a wealth of knowledge of youth skiing, programs, equipment and events. She will continue to serve as executive Director of MYSL during her time at CXC. Development coach for the U.S. Cross Country Ski Team. As one of only four coaches on the U.S. Ski Team staff, Bryan's responsibilities include coaching at national level camps, providing coaching and race support at international development races and supporting the education and implementation of a national development pipeline. MD at the Marshfield Clinic and Head Junior Coach at Lakeland Nordic Ski Team. James is board certified in Sports Medicine. His interest stems from his past personal experiences as an athlete. He has many personal athletic accomplishments. He was a six-time member U.S. National Speedskating Team, he also has had multiple top 200 finishes in the American Birkebeiner and is still actively racing, and was inducted in March, 2007, into the Wisconsin Soccer Association Hall of Fame. Dr. Mullen and his family are very involved in wellness and physical activity events in the Minocqua area and have a vested interest in the health and well-being of their community. Presenting on: tips for teams on coaching adaptive athletes, integrating adaptive skiing into team and club events, and activities, and sharing his pipeline experiences from student athlete to Paralympian. Thomas is a Central Division cross country instructor, examiner and chair of the Nordic Education/Certification Committee for Professional Ski Instructors of America. US Ski & Snowboard Cross Country Level 100 coach. Scott has been a skier for all of his life, both Alpine and XC. He was a PSIA Alpine instructor for many years following his release from the Army. He has been a US Ski and Snowboard/FIS Technical Delegate for 25 years and Regional Officials Coordinator for Central for most of that time. Working with then USSA Scott was instrumental in the organization of CXC and acted as the Director/Program Manager for those early years. For many years he coached the MW JO skiers as well as with the WI HS League. Scott and his wife Kay ran camps at Cresthill Resort in Hayward, WI for WI HS juniors, Masters, the Central Elite Group, MW Juniors. They provided housing for many of CXC Team athletes over the team's first 5 years. In 2006 Scott was recognized by USSA as the national Nordic Volunteer of the Year with the Al Merrill Award. Today Scott continues his activities as FIS TD, FIS Homologation Inspector, resort owner, grandfather, and outdoor sports enthusiast. Jim Tervo, a current FIS official, will present on several topics that deal with race sanctioning and lines of communication between race organizers and coaches/officials. Jim has been involved in Nordic skiing since the early 1970s. As a current official, he has evolved into the Chief of Competition role for the Junior Nationals and the US National Championships. He has also served as a tour director at the Birkie, the Super Tour, the NCAA Championships, JNs, and regional level races too numerous to list. Don is a professional First Aid and CPR Instructor from Minnesota's Iron Range. Away from his day job, Don is a youth coach with the Mesabi East-Virgina-Eveleth-Gilbert ski programs and enjoys spending time with his family in the out doors. Coaches affiliated with a club with current CXC Club Membership or U.S. Ski & Snowboard Club Membership for 2018-19 season receive $60 off. Also, if you have already renewed your CXC/U.S. Ski & Snowboard Coach Membership, you will receive a credit at checkout reflecting your membership payment. Individuals affiliated with a club with current CXC Club Membership or U.S. Ski & Snowboard Club Membership for 2018-19 season receive $60 off. The Level 100/200 coach should have training in First Aid & CPR and maintain current certification in both. To update your certification: take the course and email or fax copies of certificates/cards to Sport Education at education@ussa.org or 435.940.2790, include your USSA number. Please register by Friday, October 12 in order to receive certification materials on time. You can also register on site. Late registrations are not guaranteed conference swag and certification materials. Please bring running shoes, training apparel, classic and skate rollerski equipment if interested to participate in the outdoor activities. Athletic Training for Cross Country Skiing and Level 100 Technique Clinic can also be observed without participation. LEVEL 100 CERTIFICATION is recommended for coaches working with all ages and levels of cross country skiers. It is designed for the coach to learn the fundamentals for effective coaching in cross country skiing and to demonstrate basic knowledge in these areas. 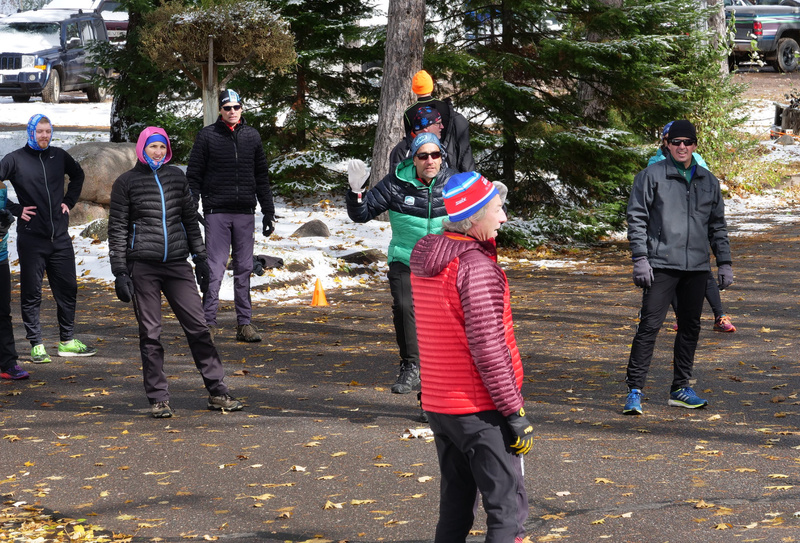 LEVEL 200 CERTIFICATION focuses primarily on physiology and training methods for developing cross country skiers, while giving coaches more tools to teach effectively and to prepare their athletes for competition. The Level 200 education track consists of a coaching manual with contributions from over fifteen different authors who are experts in the various domains of the course. The manual also covers the coaching principles content that previously was delivered through the American Sport Education Program (ASEP). The new Level 200 is delivered through in person clinics by certain regional governing bodies, this is the recommended method for the certification. For those coaches who do not have an in person clinic in their area, the content can be studied online.